July 22 2015. We are now less than a month away from the USATF Masters 1 Mile Road championships as part of the HealthPlus CRIM Festival of Races in Flint, Michigan. On Friday evening, August 21st, Masters runners from across the country will try their feet on the roads of Flint to see who is the fastest of them all. We are sandwiched between the Professional Runners (Women 7 pm; Men 7:07 pm) and the High School Challenge and Young Runners Mile (7:45 pm), with the Michigan Mile, open to all, finishing things off at 8 pm. Many runners will enjoy the challenge of running a fleet mile on Friday, getting a few quick hours of shut-eye and then bouncing off to the starting line of the famous CRIM 10 Mile Run Saturday morning at 8 am. For those who are not quite that ambitious, or would like to sleep a little later, there is an 8K and a 5K race later in the morning. Masters Women start at 7:20 pm and Masters Men at 7:30 pm. And who will tow the line? Last year, with the exception of the Atlanta Track Club, all of the teams entered came from the Midwest and Middle Atlantic. This year we will have Men's teams from Coast to Coast and from the Mountain West. Most runners and teams have not entered yet but the Cal Coast Track Club is sending a 40+ team so we know there will be some west coast speed. So far we know John Gardiner is coming from Cal Coast but are not sure who will join him. Christian 'Cush' Cushing-Murray showed us at San Diego that he has Half Marathon chops. I hope he will be coming to show us that he still has a miler's legs under him. Whoever comes, Cal Coast will be a force to reckon with. From the other end of the country comes the formidable Greater Boston Track Club, which is sending both a 40+ and a 50+ club. Christian Blondin, who ran a 4:13 in a very fast Manchester (NH) Road Mile earlier this year and a 4:06 1500 meter run at the USATF Masters Indoor Championships, is the one runner identified so far for Greater Boston's 40+ team. and the Genesee Valley Harriers, who took 2nd last year will, no doubt, be looking to shake things up as well. 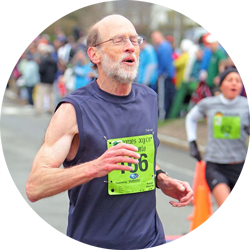 In the 50+ division we already have the Greater Boston Track Club entered, as noted, with Bill Newsham identified for the club.The Ann Arbor Track Club did not compete in the 50+ division last year but will this year. Hugh Kuchta, who took 2nd in the M55 division here in 5:44 last year, is their lone runner identified so far. I presume that the Playmakers Elite/New Balance team will be back in action. Last year they had the luxury of splitting their top 6 runners into 2 teams that were quite closely matched, finishing within 10 seconds of each other. Team B (Eric Stuber, Daniel Dixon, and J.D. Pepper) ranged from 5:01 to 5:09 while Team A (Ron Zywicki, Tim Lambrecht, and Ruben Henderson) ranged from 5:07 to 5:11. This year they may have to strategize a bit more with the added competition. Although with such closely matched runners, fitness on the day will mean more than any general seeding. In the 60+ division there are teams entered from Michigan, Colorado and Northern California. Ann Arbor TC is sending an A and a B team. The indomitable Wally Hayes, bouncing back from getting a stent for his heart in early April, is competing for the A team but their other road warriors are not yet identified. I presume that John, the 'Iron Man', Tarkowski will be there for Ann Arbor but there are some imponderables. 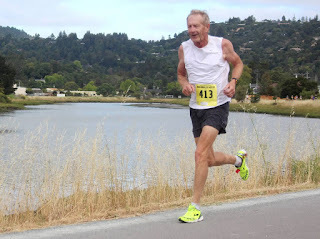 Doug Goodhue was injured at Club Cross last year, causing some nagging knee pain which forced him out of the USATF 8K Championship at brea CA. He has since run some good 10K's. Will he be fully fit? Will he run for the 60+ team or will Ann Arbor also enter a 70+ team? And what about Lloyd Hansen? Hansen suffered a stress fracture in a Half Marathon race in Des Moines in April. He has since been able to resume training but it is not clear that he will be fully recovered, and even if so, will he want to travel all the way from Salt Lake City for a 1 mile run? The Ann Arbor B team has only Dave Minier identified so far. The Boulder Running Company is sending a juggernaut of a team. Of the three runners identified so far, one, Doug Bell, is a Masters Hall of Famer and another, Jan Frisby, is a multiple Runner of the Year and recent record smasher. Bell anchors the team; I don't know when he last ran a race as short as a mile but he did run a 2 mile at Longmont CO last November in 11:37. Frisby, the long strider from Grand Junction, is stepping down in age division to shore up the BRC 60+ team. Even though Jan is shattering M70 records, he is likely to be a depth runner on this team. John Victoria rounds out their entrants, at least based on entries so far.Victoria ran an 18:58 5K in the St. Patrick's Day run in his hometown of Colorado Springs. Devin Croft is entered as an individual but I would expect him to be part of the team too. doubt, be up toward the front in this division. Excellent! Should be some great races!